At Otus, we want our users to be able to quickly capture as many points of student performance as possible. 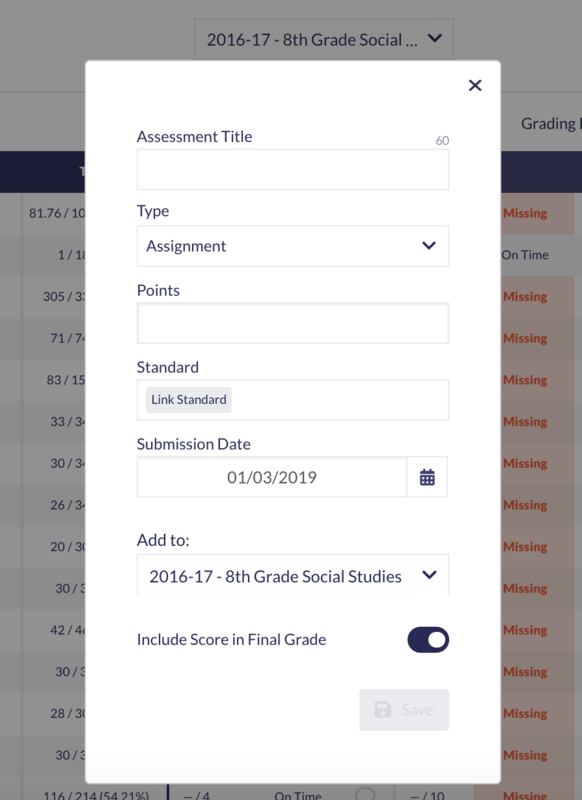 The + Assessment feature allows teachers to quickly data for assessments you’ve given outside of Otus (observation, exit, slip, etc.. ) and connect to a standard. You can add a + Assessment to your Points Gradebook by selecting Gradebook from the left-hand navigation menu. From here, choose the appropriate class from the center drop-down menu and then click on the + icon located in the upper left hand corner of the gradebook table. A pop-up will prompt you to enter the Assessment Title, Type, Total Points, Link to Standard (optional), the classes you wish to assign to (You can select multiple, but if you exit the grading before grading all of them, you can re-enter them from Assigned Assessments or the points gradebook), and Submission Date. You can add a + Assessment to your Gradebook by selecting Gradebook from the left-hand navigation menu. From here, choose the appropriate class from the center drop-down menu, click on the Standards tab to navigate to your standards gradebook, and then click on the + icon located in the upper right hand corner of the gradebook table. A pop-up will prompt you to enter the Assessment Title, Type, Grading Scale, Link to Standard (required for a standards based + Assessment), the class you wish to assign to (You can select multiple, but if you exit the grading before grading all of them, you can re-enter them from Assigned Assessments), and Submission Date. After creating an assessment in your gradebook, you will need to grade it! Click the link below to learn how to input grades and edit the status of an assessment.